Not to sound too much like a finger-wagging extraterrestrial (“Your stupid minds! Stupid! Stupid!” — Eros, Plan 9 From Outer Space), but it’s pure arrogance to expect space aliens to master the Queen’s English from the get-go, let alone to have tongues capable of forming sentences like “Sheila seldom sells shelled shrimps.” The mystical sci-fi adventure-weeper Arrival makes the credible case that you can’t get anywhere with ETs if you don’t know exactly what they want, and you can’t know what they want if you can’t ask and they can’t answer. Are they here to exterminate us? To save our bacon? To make us part of an intergalactic ­performance-art piece? Having arrived in titanic wedges that look about a mile high and are settling — seemingly at random — in spots all over the Earth, these aliens seem even more Rorschach-ian than the ones behind Stanley Kubrick’s monolith. Much of Arrival — the part that sticks closest to its source, egghead sci-fi cult figure Ted Chiang’s “Story of Your Life” — is an eerie, tantalizing, altogether superb puzzler. As directed by the Quebec-born Denis Villeneuve, it reminds us that much of what we assume about life outside this planet is based on our own dumb pop culture. In films as various as Incendies, Prisoners, and Sicario, Villeneuve mingles penetrating close-ups with chill, blurred backgrounds to make us intimate with characters who are trying to discern the rules of existence in a void. Strangeness is the only reality. 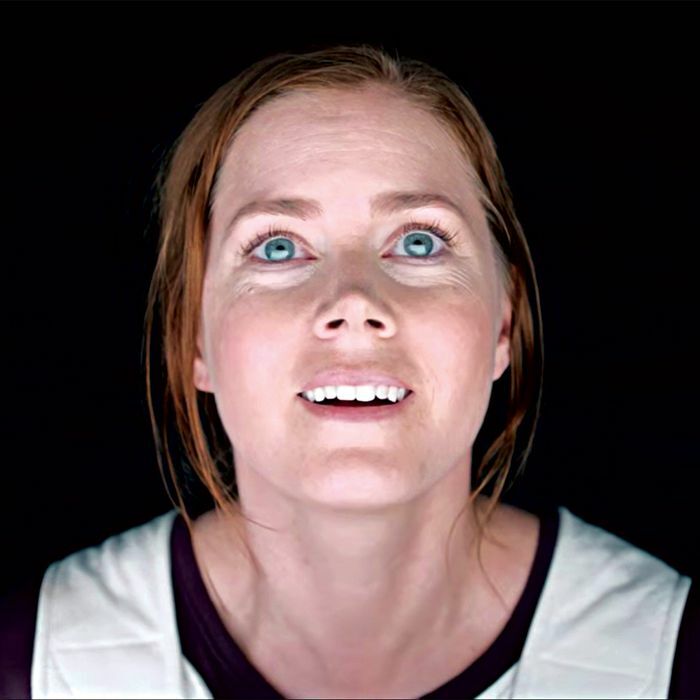 Arrival’s hero is Dr. Louise Banks (Amy Adams), a linguistics professor. She’s a woman in mourning for a lost daughter, seen in dislocating glimpses from cradle to hospital deathbed. Adams seems born to be Louise. She’s a grounded actress, direct and plainspoken. But there’s something brittle about her, as if she has survived a trauma and can’t quite break through into the moment. Her blue eyes are alien-blue, not fully of this world. When Louise enters the spaceship’s long, vertical entryway, her body twisting as it undergoes changes in pressure and gravity, she’s clearly on a voyage of self-discovery as well as scientific knowledge. That’s the part of the puzzle that grabs us. But there’s another, equally insistent puzzle: Why did Villeneuve and the screenwriter, Eric Heisserer, let the grade-B military melodrama run away with the story? The thrust is that a Chinese general named Shang (Tzi Ma) wants to start blasting the alien ships — and since we never hear from the American president, it’s as if the fate of the entire planet were in the hands of a stereo­typical warmonger. Arrival doesn’t crumble, exactly. It’s still suspenseful. But the two parts of the film inhabit a different time-space continuum. The reason for this disconnect is that Chiang’s story isn’t really about an extra­terrestrial invasion — let alone a paranoid military. It’s a device for challenging Newtonian physics and linear time, which Einstein once called “a stubbornly ­persistent illusion.” What Louise comes to realize is that merely learning the aliens’ syntax will require changes in our brains — a controversial idea in linguistics but one that’s seen, by its partisans, as bringing us closer to a unified theory of matter. Chiang wants to move the sci-fi border in the direction of quantum physics.